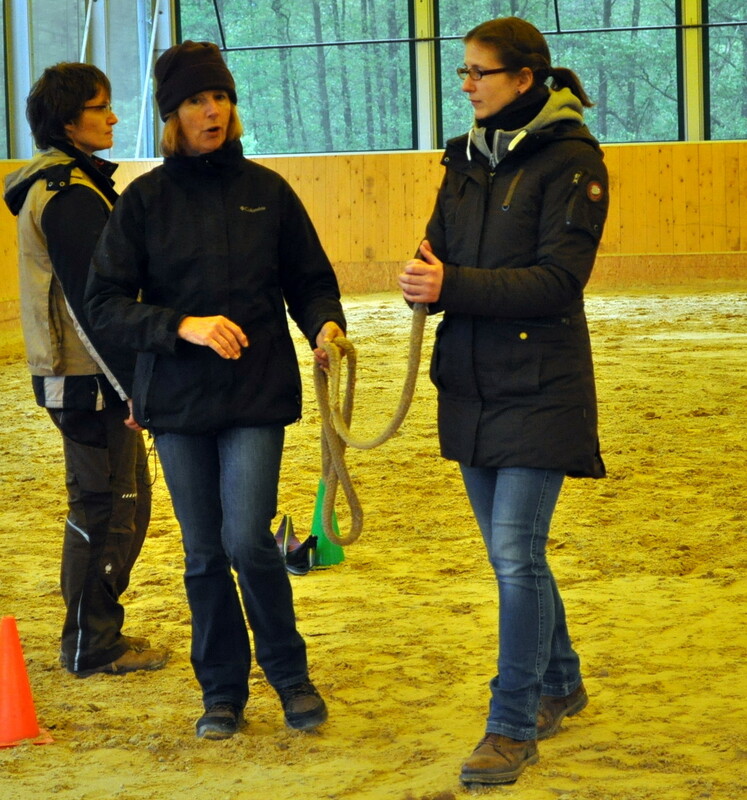 Obstacle training can be of huge benefit to many horses. There are some of the fearless types out there, but horses will naturally tend to be a bit flighty in the presence of an unusual object, or that plastic bag in the ditch. For many horses the immediate reaction is flight, which sometimes results in an involuntary landing by the rider! Can we help these horses to become braver? We certainly can. We can use our training skills to give them a different view of many strange objects and situations and encourage them to become more calm and relaxed around them. One area where many horses struggle is going through a narrow gap. For this reason we can teach our horses The Squeeze. Nautrun features in the video below. 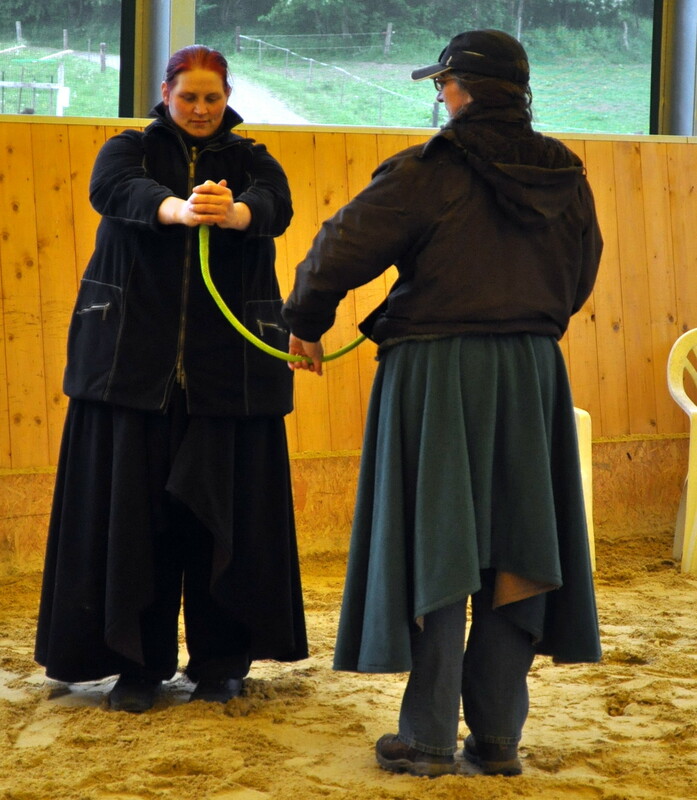 She is fairly green in terms of her training and has never done any work with obstacles before. Here she is being introduced to squeezing between two objects at least 1ft /0.3m wide and 4ft /1.2m high with a gap of 6ft /1.8m between them. I’m using the term achievable incremental steps. For one horse who is already quite brave and bold, these steps may be quite big, while other more sensitive or nervous horses may need to take things in much smaller steps. It is important to work at YOUR horse’s pace and take breaks as required. Remember every horse is an individual. Your horse may need to just do a little in one session and come back to it again in another session. For fun we decided to try a narrower gap. Having successfully conquered squeezing between two objects at least 1ft /0.3m wide and 4ft /1.2m high with a gap of 6ft /1.8m between them, for the Tölt Club monthly challenge (Tölt.Club), we decided to have a bit more fun and see how she would fare with an even narrower gap of 4ft /1.2m. She did very well so at the end, she is off the leadrope and going through solo! Like some other new horse owners, we bought a two year old filly with little or no practical knowledge or experience of horses. Misty was our family cob. 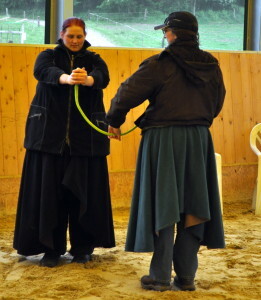 I ‘started’ her with a traditional training book in one hand and a lunge whip in the other. And yes, many, mistakes were made. 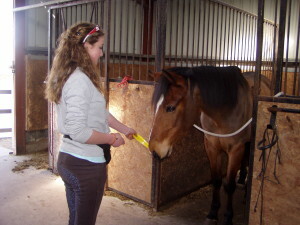 We were very lucky to have chosen a patient and good-natured horse. My children had recently joined the local pony club and one thing I did know was that loading ponies into a horse box/trailer/float was frequently a huge problem. (See Shadow’s story) This, I decided, would not be a problem for us. So I borrowed a horse box and parked it in the field. Initially we fed Misty close to the ramp, then moved the bucket onto the ramp and gradually further and further into the box. She quickly learned that it was a great place to go….very rewarding. During the hotter days, she discovered that it offered a great escape from flies. We never lead her or asked her to go in. She simply made her own arrangements. There was a front ramp so she could walk out and with no partition in a two-horse box, she could also turn around to come out herself. 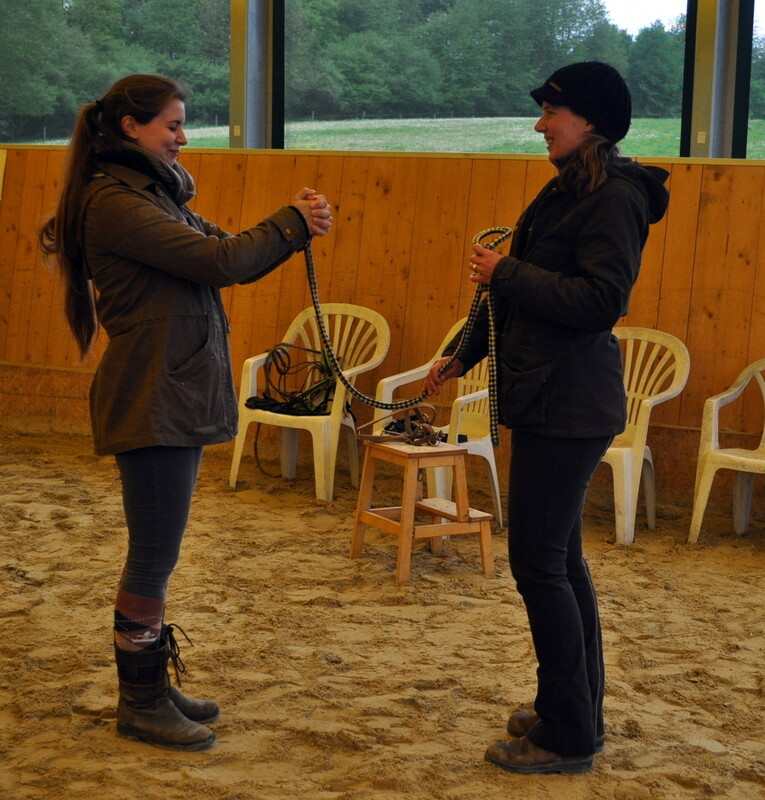 So with a completely confident pony, we decided to formalise the training. The partition went back in and we lead Misty into the box. There was always a treat to be had inside and by now the sight of a horsebox was sufficient to have her attempt to tow her handler up the ramp! The one thing we did not train well was the backing off to unload. We had a front unload for years and it was never an issue. Some years later, we had to ask her to back off. She happily obliged but then fell off the final step and gave herself a fright. At that point clicker training had come into my life and so it was easy to teach her to back out one step at a time with a click and treat after each step. We then warned her when she reached that step down with a verbal cue “step”. Now she will happily back to close to the edge of the ramp and wait for her cue to tell her to step down. We work with horses. Many are big powerful animals and can be intimidating to work with. We may love our horses but fear is a big factor that can come into our relationship and is not to be lightly dismissed. Fear often makes us aware of our own limitations and keeps us safe….hugely important. Sometimes, however, our fears can be because of an old accident or incident with a different horse and may, to some extent be illogical. Nevertheless, these fears are very real. But we can help ourselves. 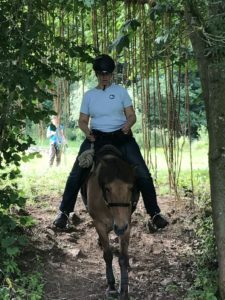 As part of her clinics and online course, Alexandra Kurland shares some wonderful simple exercises that help the rider/ trainer become balanced over the balls of their feet, free up the neck and show the benefits of bone rotations. They also help us open up across the chest and, as Alex says,” fill our own space”. They only take a few minutes but make a significant difference to the human bodies and so I also incorporate them in my courses. They help us to become centred, grounded, stable and so, much more relaxed, comfortable and confident in our bodies. When we got together in April, I introduced the Dorset clicker training group to Amy Cuddy….not in person, but via her wonderful TED talk. If you have a spare 20 mins at some stage, I can highly recommend spending them with Amy. Not only is the information she gives us fascinating, but so is her own story of triumph over adversity! Amy is a social psychologist who has studied the effect of body posture on our brain chemistry. Standing for just 2 minutes in a “power pose” can increase testosterone and lower cortisol levels in the brain. This is just enough to reduce anxiety and increase confidence to allow us to “fake it ’til we make it”. So, what’s a power pose? Well there’s the hands on hips, chin out, chest up, Wonder Woman pose. or the hands raised high in the air in the “I’m the winner” pose. Just two minutes are sufficient to give the boost that is needed. Abigail, one of the course attendees, had taken this away with her from the workshop and practiced each day as her horses had their morning feed. 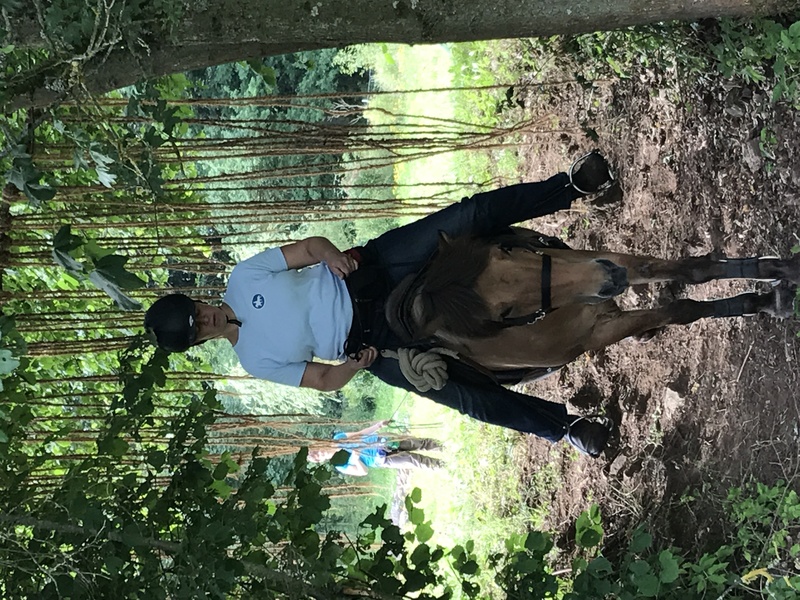 She had found great benefits from this simple exercise, going to her horse in a much more relaxed and positive state of mind than previously. So we added this to our daily routine with some great success….why not give it a go? Years ago my husband made a comment that struck a chord with me. He said that dogs can enjoy an outing much more than horses. When I tried to argue this he said,dogs get to run around, sniff and pooch at things but horses only get out when they’re ridden and they never get a choice about where they go! He was so right. I now love working at liberty and giving my horse the choice to stop and pooch. Newbie and I have a great relationship which allows us to do a lot of work at liberty…on the beach. I live on the shores of Tralee Bay, a shallow bay, several miles across, which pretty much empties on low Spring tides. In addition, Tralee Bay opens to the Atlantic Ocean and the next parish west is in the U.S.of A! So we have a wide and wonderful playground, swept clean daily with lots of (seaweed) mats randomly arranged just for us. We can lunge, trot, walk together, go from mat to mat at liberty and add in the leg flexions he loves. We can be walking casually along when he decides to collect up and offer shoulder-in at walk….magic. Yesterday we were out together just strolling along when he suddenly stopped. When he stops to look at something like that, I usually just keep walking and he joins me soon after or I call him to come. And he trots over to me. Yesterday that did not happen. The local primary school is close-by with a small sheep field between the school and the beach. Obviously taking advantage of a fine spring day, there were the sounds of a game being played in the yard, complete with sharp referee’s whistle. In a classroom there was a tin-whistle lesson taking place. (For anyone unfamiliar with the Irish tin whistle being played by a group of young learners, it can be a tad piercing and excruciating) Brave teacher! The unusual noises alerted Newbie who stopped to look, but then the sheep decided they had had enough and took off across the field. Newbie turned to look at me when I called, his head high in alarm, but then clearly felt that home with his herd would be the better option. He headed off in that direction, happily only at a walk, so I walked back, not towards him but parallel to him until we were past the sheep field. I called him again. This time thankfully, he came to me but he was not happy…head high, looking towards the field and foot moving. He lowered his head for me to pop on a headcollar and attach rope reins but clearly he was not happy to have his head down when all those sheep thought the best option was running around! So it was one of those ‘what to do?’ moments. Insist on head lowering? Head smartly for home? or put him to work? We were in an area where there were some of my beach ’mats’ available and Newbie loves his mat-to-mat work so this is what I decided to do….put him to work with something that he loves and feels comfortable with. We went from mat to mat at walk. I used the reins to ask for collection prior to moving off and to give him a direction to the next mat but then released him to step on it. We did this for some time and the familiarity and rhythm of the work quickly settled him down. When I felt he was relaxed, we then walked away to a different area (away from the sheep), where he was happy to stay with me at liberty once again…although I did leave his headcollar on! A few minutes of just walk, halt, back-up games and we headed home. The next day we came onto the beach with Newbie ‘dressed’ in headcollar and reins. We strolled casually to in front of the sheep field. It’s spring and there are now lots of lambs bleating, so his head was up listening to all this relatively new noise, coming from what had been a scary place just a day ago. We started mat work and very quickly his focus returned so that we could play with reverse arc circles and even trot (which would have been unthinkable the previous day). After a few minutes (time unknown….I often think we’ve been out for 5-10 min and check my watch to find it’s been closer to 30min!, we headed off up the beach, both of us with enough confidence for me to take off the reins and enjoy some casual liberty time.